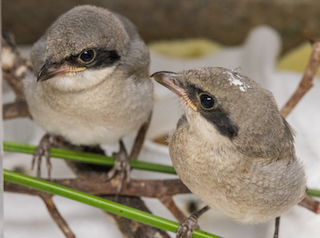 Two nestling loggerhead shrikes were admitted to the clinic after being knocked out of the nest when a car struck the tree containing the nest. Shrikes are nicknamed "the butcherbird" because they impale their food on thorns or barbed wire so it is easier for them to eat. The two young birds have been eating very well and are growing rapidly. They are being fed 6 to 8 times a day using long tweezers or forceps. For a video of the shrikes feeding, visit our YouTube Channel at https://youtu.be/yLzH6e4AOMk. The two shrikes continue to grow and are doing very well. Today they were fed soft (no bones or fur) mouse pieces. 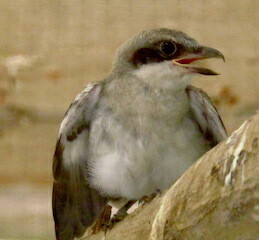 The two shrikes are now eating on their own when food is left in the enclosure. They have both gained over 10 grams (they only weigh 43 grams!) since they were admitted to the hospital. The loggerhead shrikes were moved to an outside enclosure today. In the larger enclosure, they will be able to improve their flight skills as they get closer to being released. 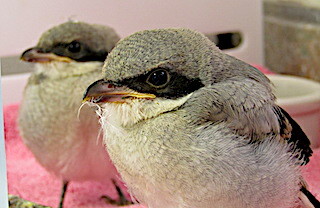 The two loggerhead shrikes were released on Wednesday, May 10 in Fort Myers, Florida.